Honoring the wedding traditions of the past… while moving forward with pride! We firmly believe that not one Officiant/Celebrant can be the end all – be all to every couple. Each one has their own merits in style, personality and presentation. We are the fun, happy and lighthearted type of Chaplains. We tell our couples that if they are looking for the long winded, poetic and reading from a book type of Officiant, that’s not us! We love being part of a fun and uplifting celebration and believe the ceremony should segue to the reception not the “Oh Dear God, we have to sit through this to get to the party”. There is a BIG difference between being a comedian and being lighthearted and we know the difference. Plus, by showing our couples how they can be as creative in the ceremony planning or showing them how simple we can make it, lends to the ceremony reflecting the two of them, not who we think they are. After a few thousand meetings with couples to discuss their celebrations there is one common denominator; The majority of couples have never gone through the Officiant selection process before and have no idea what to ask, what to look for in an Officiant and most importantly, how to express their wishes and desires for their ceremony. They simply trust the Officiant to handle it. We break down this barrier and show each couple how they can be part of the magic! Your personalities should shine and be presented on your wedding day, not what we think it should be. 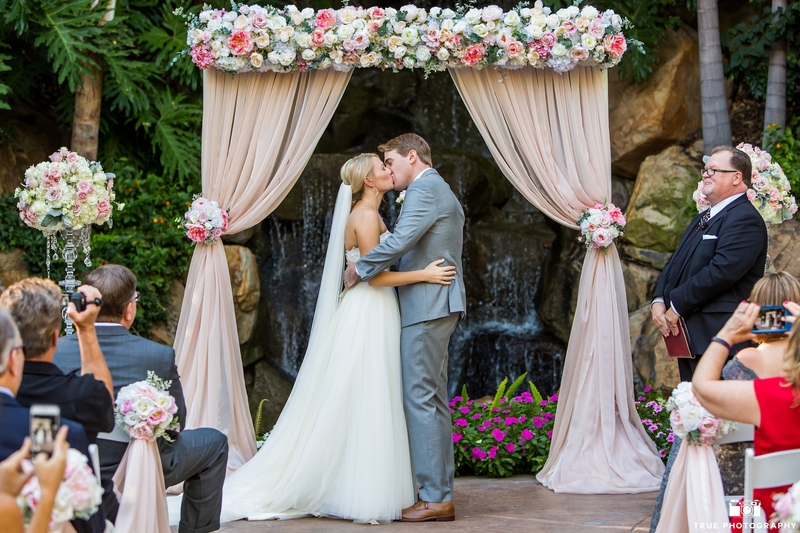 We simply walk you through the ceremony process, from processional to recessional and everything in between. 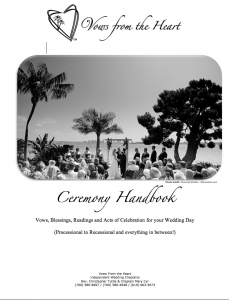 The Vows From The Heart “Ceremony Handbook” allows this to happen; Easy, step by step instructions and ideas. You choose the style of your presentation; Really, it’s up to you! We serve as a Wedding Chaplain giving us the ability to respect and observe all Faiths, Beliefs and yes, even those couples Non-Beliefs without judgment or with a hidden agenda.